URAYASU, CHIBA—As part of the “Tokyo Disney Resort 35th ‘Happiest Celebration!’” anniversary event this year, Tokyo Disney Resort® will host a variety of Christmas special events, entertainment and activities at Tokyo Disneyland® Park, Tokyo DisneySea® Park, the Disney hotels and the Disney Resort Line from November 8 through December 25, 2018. Guests visiting the Resort with family, friends and others dear to them will find a special, heartwarming atmosphere for the holiday season. The Christmas event at Tokyo DisneySea will have a new theme this year and feature “It’s Christmas Time!” -a splendid, colorful revue presented at Mediterranean Harbor during the daytime. 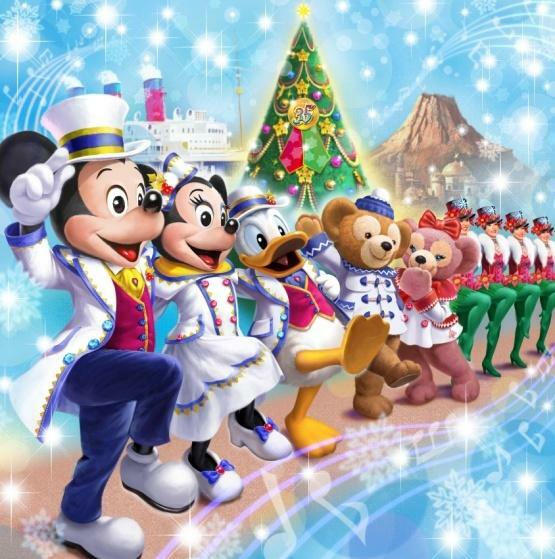 This new show will enchant Guests with live performances of songs, tap dances and a high-kicking precision dance that create a wonderful holiday mood unique to Tokyo DisneySea. 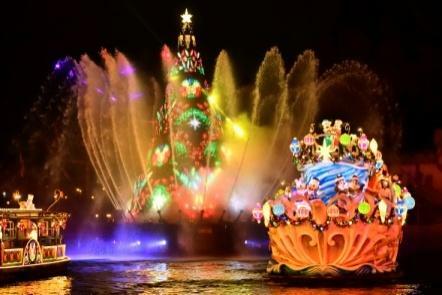 Again this year, the sparkling and romantic “Colors of Christmas” will be presented on the harbor waters after dark with the Disney Characters appearing on new barges. In American Waterfront, a 15-meter-tall Christmas tree decorated with the 35th anniversary logo will be set up in front of the luxury ocean liner, S.S. Columbia. New decorations and illuminations will give Lost River Delta an even more colorful and lively Christmas ambience. 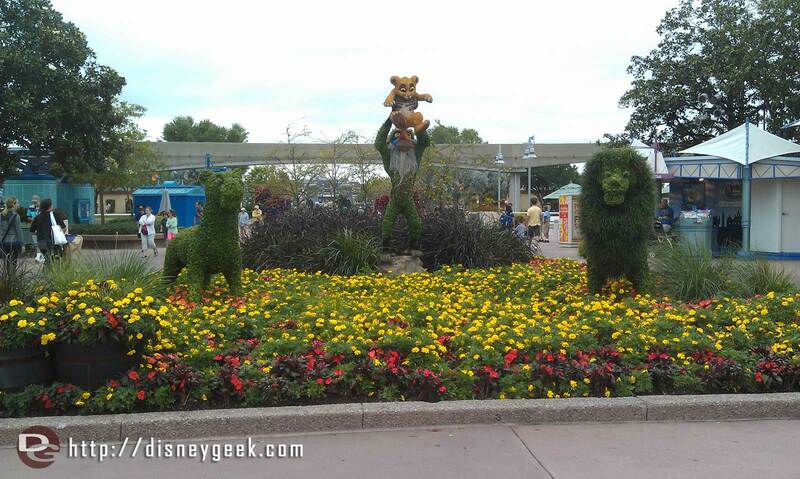 And Guests will also enjoy the unique illuminations decorating other areas of the Park. 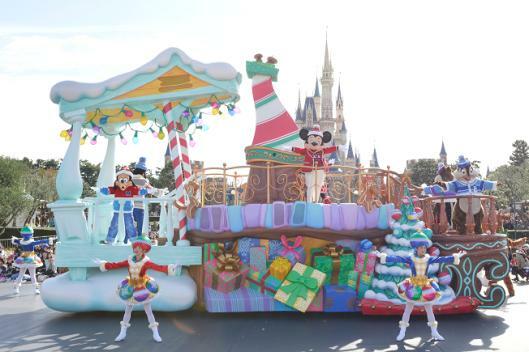 At Tokyo Disneyland, the Christmas event will reflect the 35th anniversary. 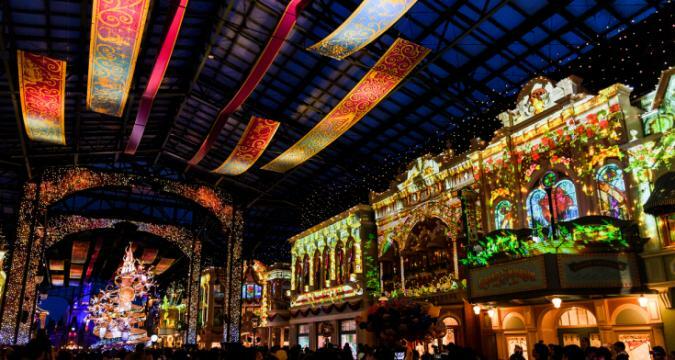 Designed expressly for the 35th anniversary, “Celebration Street” in World Bazaar will be presented in a special Christmas version after dark. This performance, with the Celebration Tower decked out in Christmas colors and holiday music, images and lights transforming the area, will create an unforgettable experience for Guests. This year, the main Christmas tree will be set up on the Fantasyland side of Cinderella Castle and, to mark this milestone year, the 35th anniversary logo will be the featured decoration. During the daytime, “Disney Christmas Stories” will be presented along the parade route again this year. Pages from storybooks showing the Disney Characters having fun at Christmastime will be brought to life in this parade. And all through the Park, Guests will be able to enjoy a colorful and heartwarming world of Christmas as only Tokyo Disneyland can offer. 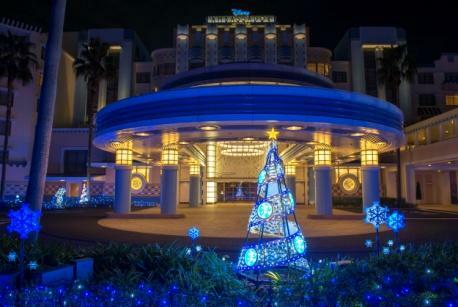 Guests will also be able to enjoy the holiday season outside of the Parks at Disney Ambassador® Hotel, Tokyo DisneySea Hotel MiraCosta®, Tokyo Disneyland® Hotel and the Disney Resort Line. Premiering this year, “It’s Christmas Time!” is a spectacular revue set to popular Christmas music. The live performance with Mickey Mouse and his Disney Friends together with singers and dancers will offer Guests an unforgettable Christmas interlude. Guests will be enchanted as singers perform a medley of holiday music, dancers in festive costumes take the stage tap dancing and doing a high-kicking precision dance. When Mickey Mouse and his friends gather on stage to share the joys of the holiday, two Christmas trees rise up from the harbor waters. The excitement grows as Santa Claus, accompanied by Duffy and Friends arrive by boat. In the finale, all the performers gather again for the highlight of the revue – a high-kicking dance around the harbor with pyrotechnics filling the sky. This nighttime entertainment fantasy is presented on the waters of Mediterranean Harbor and features a towering Christmas tree about 15 meters tall at the center of the harbor, as well as smaller Christmas tree-like illuminations. Mickey Mouse and the Disney Friends appear aboard boats sparkling with Christmas ornaments and help create an even more heartfelt atmosphere in Mediterranean Harbor. The Christmas tree and the floating illuminations in Mediterranean Harbor, which were illuminated in “Colors of Christmas” through the wishes of all the Guests, will sparkle and change colors in time to holiday music, allowing Guests to continue to enjoy the Christmas atmosphere for the remainder of the evening after the fireworks spectacular. 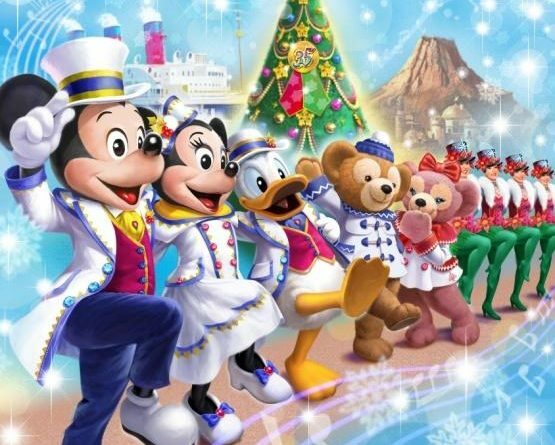 The show will be presented with a “Colors of Christmas: Afterglow” special effect of snow falling all around the harbor, creating at Tokyo DisneySea a romantic atmosphere. Special Christmas versions of atmosphere entertainment and Disney Character greetings will also be presented. 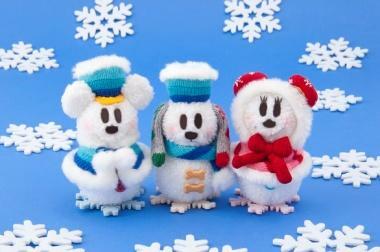 Each of the themed ports in Tokyo DisneySea will be decorated for Christmas in a unique way. Towering in front of the luxury liner S.S. Columbia, located in the themed port of American Waterfront, will be a Christmas tree about 15 meters tall. To add to the celebratory mood this year, the tree will be decorated with the 35th anniversary logo. Waterfront Park will again feature “Snow Crystal Illumination” with its crystalline Christmas tree and lovely snowflake illuminations lending even more beauty to evenings in the Park. This year Lost River Delta will enhance its Christmas decorations to make the themed port even more festive and colorful. Donald Duck, Jose Carioca and Panchito will join the villagers in decorating the area. Guests will be able to enjoy the cheerful decorations and holiday illuminations with a Latin American touch. Designed for the 35th anniversary of Tokyo Disney Resort, “Celebration Street” in World Bazaar has been enchanting Guests since the anniversary began. For Christmas, “Celebration Street” will be presented after dark in a special version with music and lights to create a special holiday atmosphere. 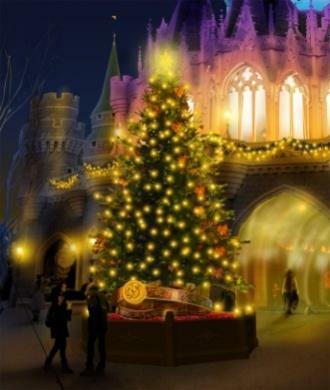 Guests entering Fantasyland through Cinderella Castle will be greeted by the heartwarming sight of a real Christmas tree decorated with the 35th anniversary logo, and at the Plaza in front of Cinderella Castle, Guests can enjoy scenes of the Disney Friends enjoying the holidays in a Christmas town scene. Holiday decorations and photo locations in each of the themed lands will immerse Guests in a holiday atmosphere filled with fantasy. This fun Christmas parade is themed to seven stories of the Disney Friends spending the holiday season with their dear ones. Leading the parade is a family Christmas scene with Donald Duck dressed up as Santa Claus, joined by Daisy Duck and his nephews. The next float has Mickey Mouse and Minnie Mouse sharing the holidays with friends, while Belle and Beast enjoy a romantic Christmas shared with a loved one. The parade stops in two locations and bells ring to mark the start of a Christmas Party. The Guests join in the fun as the Christmas music gets faster and faster until the party reaches an exciting climax. In the finale, it begins to snow as the Guests and the Disney Characters celebrate a heartwarming Christmas together. 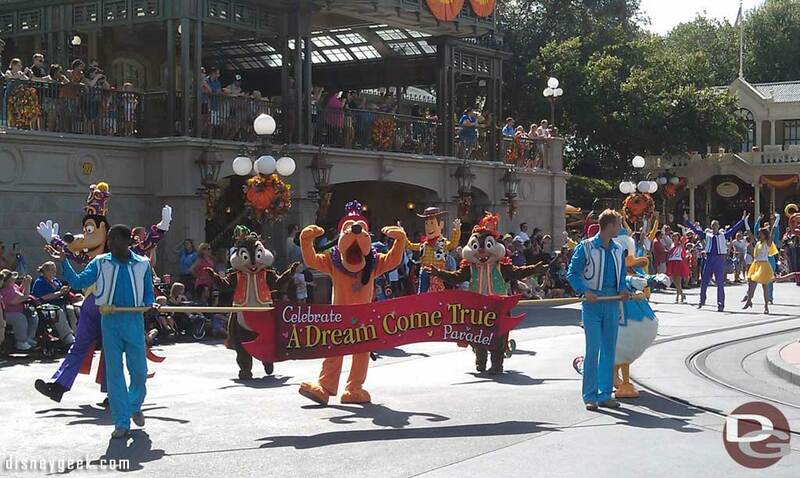 The Parade stops at the following two locations: (1) between Fantasyland and Westernland; (2) around the Plaza. Special Christmas versions of the following parade, show, atmosphere entertainment and Disney Character greetings will also be presented. The following attractions will be presented in a special version for a limited period. At Tokyo DisneySea, around 50 different types of special merchandise will be sold including stationery, plush badges, and confectionery. Designs include the Disney Characters in their new costumes for the 35th anniversary in front of the Fantasyland Christmas tree. Also on offer will be a hand cream set with simple line drawings of the Disney Characters. In addition, Duffy and Friends merchandise featuring the four characters enjoying a Cape Cod winter and waking up on Christmas morning will be available. Tokyo Disneyland will offer about 55 different types of special merchandise featuring the bright color scheme of the anniversary. New this year is a wrist band plush with a bell inside that can be shaken to join in the bell ringing of the parade. 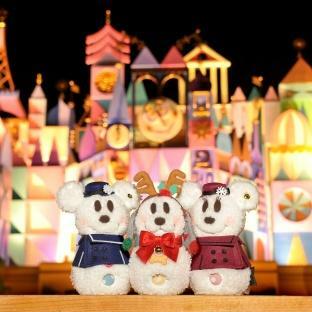 Make It Mine merchandise, which allows Guests to choose accessories and parts to customize their very own SnoSnow plush toy, will be exclusive to Tokyo Disneyland. Offered at both Parks will be about 95 types of special merchandise including Snow Pluto, a new SnoSnow character, and light-up accessories. 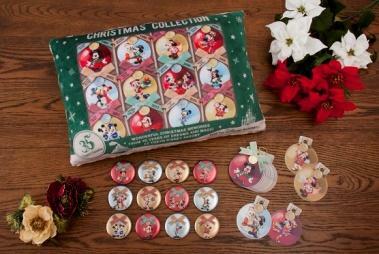 Celebrating 35 years of Christmas at Tokyo Disneyland is merchandise with designs of the Christmas events from the past, including a cushion with Mickey Mouse and Minnie Mouse wearing costumes from previous Christmas events. Notes: Special merchandise will be available from November 1. Duffy and Friends merchandise will be available from November 2. SnoSnow Make It Mine merchandise will be available from November 6. 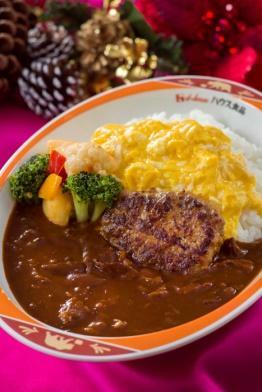 Special menu items at Tokyo DisneySea will be decked out for the holidays. At Cafe Portofino, Guests can enjoy a special Christmas course menu of pasta, soup and dessert, with subtle motifs of the holiday season. At Tokyo Disneyland, special menus add a touch of luxury to the season. At Hungry Bear Restaurant, Guests can enjoy “Hashed Beef,” a Japanese family favorite of beef stewed in a demi-glace sauce, and for those with a sweet tooth, a special doughnut inspired by Christmas decorations will be available at various locations in the Park. Both Parks will offer chocolate churros and a hot apple-based beverage. Notes: Special menus will be served from November 1. The contents of the menus may change and some items will only be available while the supply lasts. 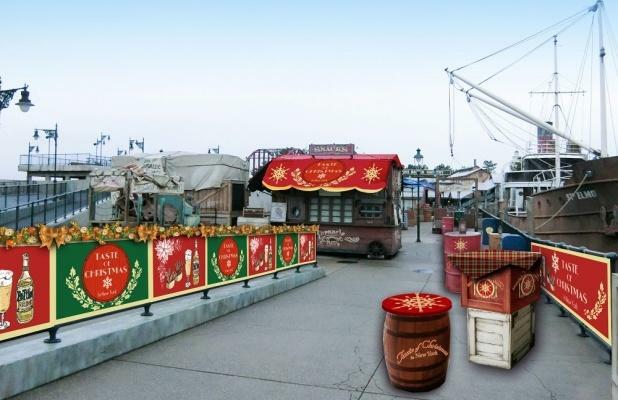 New at Tokyo DisneySea this year is “Taste of Christmas,” a food-and-drinks program held in the New York area of American Waterfront. Spending time before an evening meal to enjoy food, drinks and conversation with friends is the concept for the program. Food facilities in the New York area will be decorated for Christmas, and will be serving hot alcoholic drinks and light snacks. With this program, Guests can feel like a true New Yorker in a holiday atmosphere that is both sophisticated and welcoming. The “Enjoy the Disney Christmas at Both Parks for 2 Days / 3 Days” plan is available through the online service Tokyo Disney Resort Vacation Packages (Japanese language website only: https://reserve.tokyodisneyresort.jp/). Included in these plans are accommodations at a Disney or other hotel, tickets to view entertainment programs, Disney FASTPASS® tickets that do not have specified times, and other benefits. 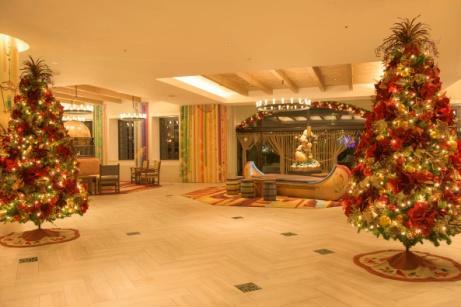 During the holiday season, Guests can experience a special time as Disney hotels will be decked out for Christmas. At Disney Ambassador Hotel, the 1930s American decor of the entrance is enhanced with illuminations that feature a “Christmas tree” created from a spiral of movie film. 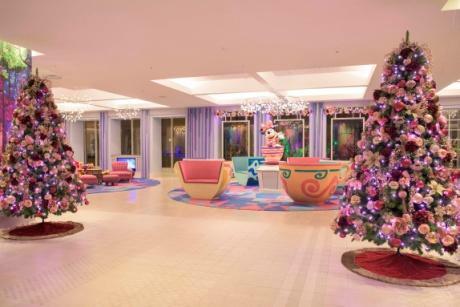 At Tokyo Disney Celebration Hotel®, the lobby at both Tokyo Disney Celebration Hotel – Wish and Tokyo Disney Celebration Hotel – Discover will feature Christmas trees with decorations representing the theme of each building. 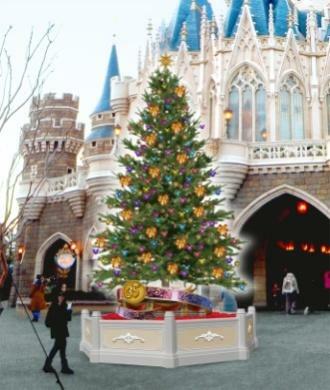 In Tokyo Disney Celebration Hotel – Wish, roses and other ornaments adorn the trees to match the dreams and fantasy theme, while at Tokyo Disney Celebration Hotel – Discover, where adventure is the concept, the Christmas trees will be decorated with frangipani and accents of red. Restaurants and lounges at the Disney hotels will offer menu items inspired by the special event held at the Park. 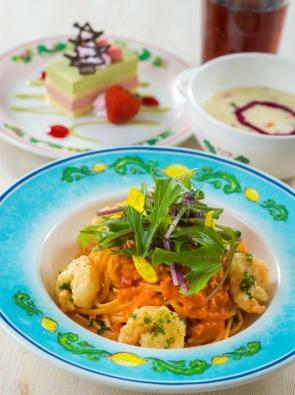 The Disney Ambassador Hotel and Tokyo Disneyland Hotel will serve dishes themed to the fun fantasy world of the Disney Friends, and Guests dining at Tokyo DisneySea Hotel MiraCosta can enjoy course and buffet menus that offer a sense of luxury perfect for the holiday season. One of the monorail trains of the Disney Resort Line will feature Christmas decorations during the event period and the four monorail stations will be decked out for the holidays with Christmas illuminations and other decorations. 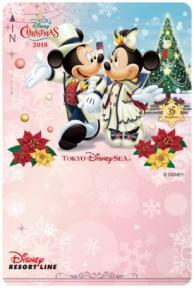 Day pass tickets will be available in a design based on the special event at Tokyo DisneySea.